The beats of Soul Sociedad are for smoked filled rooms and gloomy days. Made up of four DJs and producers; Ill Dubio, Ketepica, Lu-Fuki and Skymark, Soul Sociedad have been a BTS favorite dating back to ‘06. Based across Switzerland and Spain, Soul Sociedad (Spanish for ‘Society’) live for dusty crates, hip-hop and of course, soul. It's not only their premier selection of loops and chops, the Soul Sociedad crew dabble in corners of House and future R&B, being one of our most underrated, and underappreciated crews. The majority of their beats have always itched for a veteran East Coast MC, it’s no surprise that Skymark’s “Stay” from his Deep Soul Revisited series caught the attention of Ghostface Killah. Ghost used Skymark’s track on his Ghostdini: Wizard of Poetry in Emerald City album. Recently, Skymark established his own label, Modern Sun Records and released an LP earlier this year titled, The Sound Of Silence. 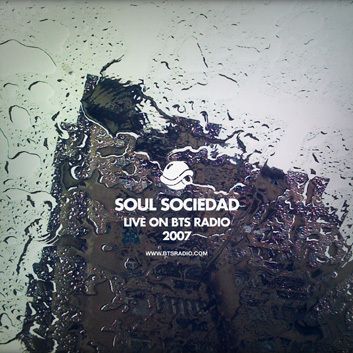 Check the Soul Sociedad crew, live on BTS in 2007, and one of our personal favorites from the vaults. It’s also the mix responsible for our “BTS” drops you may be familiar with. We still don’t know who that girl is, but we'd like to thank her for being apart of our history! Listen up for that Dilla drop!